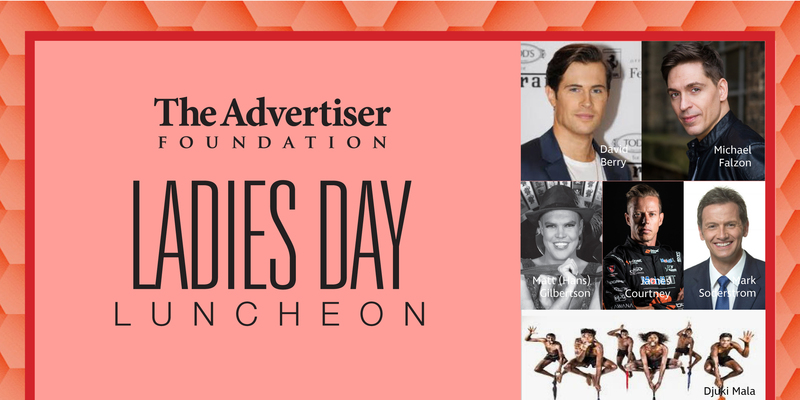 A glamorous Ladies Day Luncheon held at the Hilton on Thursday 28 February 2019. Star studded performances include the star of America’s Got Talent Matt (Hans) Gilbertson, musical theatre star Michael Falzon (Evita) and a performance from David Berry (Outlander, A Place To Call Home) and Indigenous Australian dance sensation, Djuki Mala. Supercars driver James Courtney will also be a special guest, with an Adelaide Fashion Festival presentation. Hosted by Channel 7’s Mark Soderstrom. Ticket includes a two course meal and First Creek Wines. Proceeds from this event will be supporting The Epilepsy Centre and Can:Do 4Kids. Please contact the Can:Do Events Team at events@candogroup.com.au for any further event information.